The Blackbird™ mainboard is an affordable, owner-controllable, desktop and entry server level mainboard. Built around the IBM POWER9 processor, and leveraging Linux and OpenPOWER™ technology, Blackbird™ allows you to secure your data without sacrificing performance. Designed with a fully owner-controlled CPU domain, you can audit and modify any portion of the open source firmware on the Blackbird™ mainboard, all the way down to the CPU microcode. This is an unprecedented level of access for any modern desktop-class machine, and one that is increasingly needed to assure safety and compliance with new regulations, such as the EU's GDPR. An owner-controlled, CPU-based secure boot mode also is available at any time. 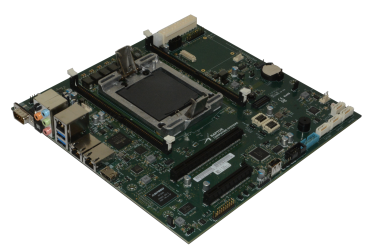 When secure boot is properly configured, and if the mainboard is located in a physically secure environment (e.g., a secure computing room or locked desktop case), you can be assured that only your pre-approved and pre-audited firmware, kernel, and user space components are executing on a Blackbird™ system. Secure and control your desktop computing today with a modern, energy efficient Blackbird™ system! NOTE: This product is the mainboard, I/O plate, and recovery DVD only. You will need to purchase at least one compatible POWER9 CPU and POWER9 heatsink / fan (HSF) assembly before you can use this mainboard. Bundles with our exclusve 4-core starter processor are available on the BK1B01 product page. NOTE: Processors larger than the 8-core 160W offering may downclock, show instability, or fail to function due to power delivery constraints, and as such are not officially supported on the Blackbird platform. Firmware may automatically downclock for stability, and/or print a warning if CPU expected power exceeds system planar capacity.